With concerns about global energy consumption at an all-time high, improving computer networks energy efficiency is becoming an increasingly important topic. Large-Scale Distributed Systems and Energy Efficiency: A Holistic View addresses innovations in technology relating to the energy efficiency of a wide variety of contemporary computer systems and networks. 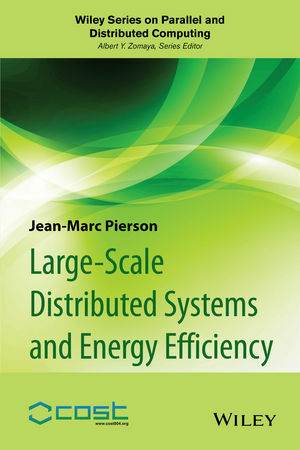 After an introductory overview of the energy demands of current Information and Communications Technology (ICT), individual chapters offer in-depth analyses of such topics as cloud computing, green networking (both wired and wireless), mobile computing, power modeling, the rise of green data centers and high-performance computing, resource allocation, and energy efficiency in peer-to-peer (P2P) computing networks. Timely and important, Large-Scale Distributed Systems and Energy Efficiency is an invaluable resource for ways of increasing the energy efficiency of computing systems and networks while simultaneously reducing the carbon footprint. Jean-Marc Pierson is a Professor in Computer Science at the University of Toulouse?(France). Jean-Marc Pierson received his PhD from the ENS-Lyon, France in1996. He was an Associate Professor at the University Littoral?Cote-d'Opale (1997-2001) in Calais, then at INSA-Lyon (2001-2006). He is a member of the IRIT Laboratory and Chair of the SEPIA Team on distributed systems. His research focuses on energy- aware distributed systems, in particular?monitoring, job placement and scheduling, green networking, autonomic computing, and mathematical modelling.